Product Description: The Amprobe TMA40A provides three measurements in one: Air Velocity or volume, Relative Humidity and Temperature. With three ways to view your measurement results. Choose between single point measurement, multiple points up to 99, or the added feature of data logging up to 2400 data points. User sets the measurement interval time from 1 to 200 seconds. 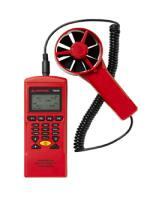 The TMA40A has a flexible cord to position vane where you need to measure. For accurate CFM results, the user simply inputs the area of the air source. TMA40A ships with RS232 interface cable, Software CD, hard carrying case and user manual.